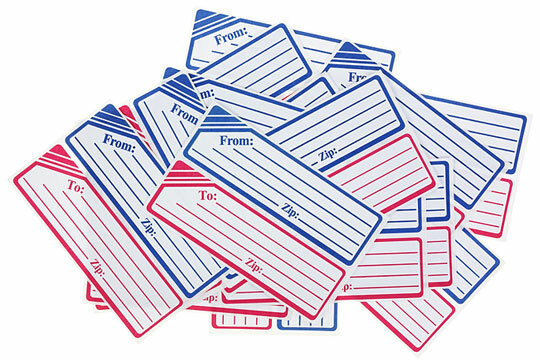 Address labels are available in a wide range of shapes and sizes. 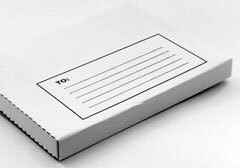 The smallest sizes are usually offered as preprinted return address labels, for use on the top left corner of envelopes and parcels. 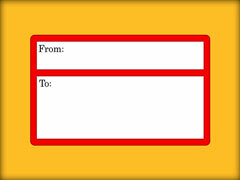 The medium sizes are generally used as mailing labels for envelopes. The largest sizes are often used as shipping labels for packages and parcels. Both sizes are usually offered as computer labels to be printed on continuous form printers, laser printers, or inkjet printers. Pin-fed addressing labels are formatted as continuous forms, and they range in size from 2 1/2 inches to 5 inches wide by 7/16 inches to 1 15/16 inches high. The most common size is 3 1/2 inches wide by 15/16 inches high. These labels are most often used for high-volume mailings. Laser labels and inkjet labels are formatted on 8 1/2 inch wide by 11 inch high sheets; they range in size from 2 5/8 inches to 4 inches wide by 1/2 inch to 3 1/3 inches high. The most common size label is 2 5/8 inches wide by 1 inch high. These labels are commonly used by small businesses and other organizations with moderate mailing requirements. Label-printer thermal labels are formatted in rolls of 260 per box; each label is 3 1/2 inches wide by 1 1/8 inches high. These labels are often used to print one address at a time or small quantities of labels. "To and From" labels include space for both an address and a return address on one label. These address labels are available with or without a preprinted return address; they are generally about 4 inches wide and 2 inches to 3 1/3 inches high. Of course, the use of address labels is not limited to envelopes and parcels. Other types of address labels are used to identify luggage and various personal belongings. Luggage tag address labels are usually 2 3/8 to 2 3/4 inches wide by 1 3/8 or 1 1/2 inches high. They include a phone number line as well as name and address lines. The United States Postal Service publishes this Preparing Domestic Shipments page to help customers prepare and address their mail and packages correctly. The USPS also offers this Shipping Labels page where customers can print domestic and international shipping labels and buy postage online. For your convenience, we have provided links to several address label printers. Vistaprint features an extensive line of customized address labels, mailing labels, and shipping labels. Seiko Instruments - Labels features address labels for their line of label printers.